The question centers around how the use of a sphere, an object so very different from the complex forms of the cast, can help us to better understand how the light on this complex form (or other forms) works. And ultimately how we might utilize this knowledge to assist us in determining values and rendering. My short answer is, that by understanding how light affects the simple forms of the sphere we can better understand how light affects the forms of a more complex object. However, this answer hardly seems adequate. For this reason I am going to endeavor to break down the connection between a sphere and a complex form further. To do this, first I would like to start not with forms but with 2-dimentional geometrical shapes. First let's take an odd shape and place it next to a circle. 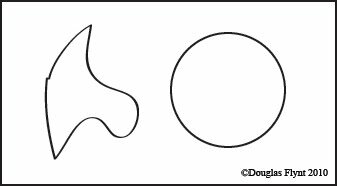 Let's say that we needed to replace a section of the odd shape's contour with a section of the circle. In doing so we would find that any section of line (when averaged in our minds to a straight single tilt) from the odd shape has a corresponding section of line or tilt (again when averaged to a straight line) within the circle. This is assuming that we could not rotate the sections of line if we removed them from their shape. 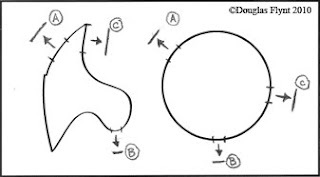 It might also be mentioned that although the corresponding sections from the circle may be a close match in terms of their tilt or pitch they might not be the correct scale in terms of their size, this however could be overcome by using circles of different sizes. So now we realize that a circle, in essence, contains all of the same line segments (averaged in or minds to straight lines), with their unique tilts or pitches, that we would find on a unique shape. Each plane on the sphere has it's own value in relation to how much light it receives. 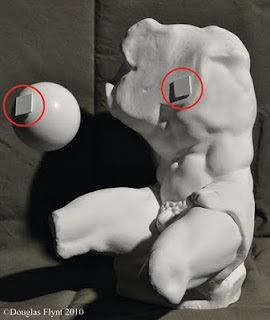 Just like with the odd shape and the circle, if we consider the spatial orientation of a plane on the cast and find its corresponding plane on the sphere they both should be the same value (value equating to their pitch or spatial tilt), assuming they both are under the same lighting conditions. This can lead us to begin to look less at the optical value of a plane and more at its spatial orientation in relation to a light source. On a complex form the amount of light a plane receives might be somewhat confusing to interpret but the same plane thought of in the context of a sphere reveals how much light it is receiving quite easily. Utilizing this conceptualization, it can be easily determined if a plane belongs to a region such as a halftone, or a highlight, not so much based upon its value but upon its orientation in space and context as part of the sphere. 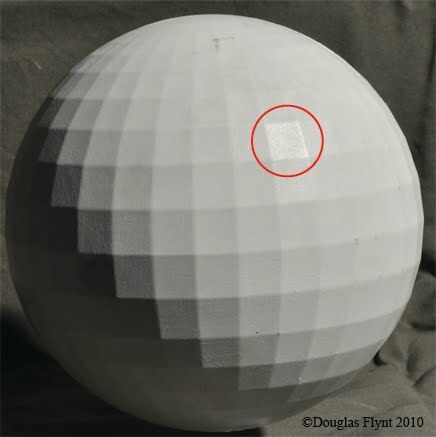 For instance in the image of the faceted sphere from earlier, the plane that appears as a highlight is rather obvious. An artist painting the cast trying to identify highlights might not look for spots of light tone to identify them but instead look for planes that have the same corresponding spatial orientation as the highlight plane on the sphere. Visualizing a sphere can be a conceptual way of keeping track of the part and the whole while still focusing only on a particular part (or parts) of a complex form. 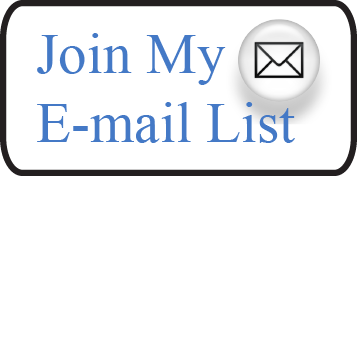 It is often noted that when painting in a "window shade" or "area by area" manner an artist may have a hard time keeping track of large value relationships—a problem of keeping track of the part in relation to the whole. This trouble can be overcome in some respects by conceptually referencing a real or imagined sphere under the same lighting conditions and then comparing planes from the object to the corresponding planes on a sphere. This is not entirely dissimilar from taking a road trip and tracking your progress on a map to maintain a sense of where you are, where things are in relation to you, and how much further you have to go. Comparing two planes on the cast and then analyzing both on a sphere can also be a great way to compare their relative spatial relationships to aid in assigning them relative values. For instance two planes facing very much toward the light on the cast might appear to be almost the same value. However if you wish to make a very subtle distinction between them you could easily decide which is lighter and which is darker by plugging them both into a sphere and seeing which one receives more light. It might also be noted that despite one being darker than the other neither can get very dark in value because they are both very much out in the light and a great deal of planes exist on the sphere between them and the darker planes of the half tones. These kinds of conceptual thoughts using a sphere can allow for very subtle distinctions between tones that optical assessments alone might not allow for. This all leads back to my original explanation for using a sphere, where I stated that by understanding how light affects the simple forms of the sphere we can extrapolate to better understand how light affects the forms of a more complex object. As with many of the subjects that I have written about on this blog this line of thought could be explored in a much more full and robust discussion—but alas, my schedule doesn't permit me to do so. 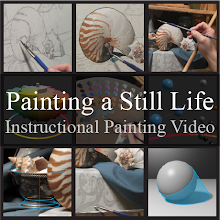 Yet perhaps the next time you're painting an object you might just think about a sphere along side it and see if you begin to understand things differently, and consequently "see" in a slightly different way than perhaps you did before. You never stop to amaze me Doug! Thanks Ariel! Carol, does this mean your not part of the Rand McNally online fan club? Thanks Craig. The sphere is actually an oversized plastic Christmas tree ornament (about 8 inches in diameter) which I painted white. I usually keep an eye out for them around the holidays. Best of luck finding one this season! Awesome info! thank you so much for posting this. Thank you Doug for all of this great technical information you have been providing us with. I was wondering if you might talk a little bit about the composition of your paintings. Is there a structured formula that you have in the back of your mind while you set up your objects or do you go with more of the feeling? Any type of advise would be great. Thanks. thanks so much for sharing all this excellent info!! As always very informative and helpful. Thanks Nlombardo, Brian and Alex. Brian, I will try to address composition a bit in some future posts. Thanks for the suggestion. Exceptional content and visual aid! You are a great teacher. Thanks for meeting with me a while back, I learned so much in just a few hours!